1. The trees must be planted in the parkway (on public land). If you have room for a tree on your parkway and are willing to make sure it gets a good start (water it and keep it mulched for the first few years), let us know! The trees must be selected from the City’s list of approved trees that are suited for North Texas (list attached). Belmont, Goliad, Palo Pinto and Velasco may chose from either the Large Canopy Tree list (preferred) or the Small Tree list. Due to the size of its parkways, Llano may only chose from the Small Tree list. Parkways with overhead utility lines must also chose from the Small Tree list. There are lots to choose from, and the trees we get are always very nice. The deadline for submitting your tree requests is September 12th. All tree requests need to be directed to Claudia Worme (cjworme@sbcglobal.net). Trees will be granted on a first order, first serve basis, with a limit of 2 per house. We will make our best effort to honor your tree requests, but the City has the ultimate say on what trees we get and where they get planted. The City Arborist will do an onsite review of the tree requests for the final approval. In the “subject” line of the email, state “BACD Tree Request” so that Claudia recognizes it as a valid email. 9. Confirmation that you are available on Planting Day to assist in the planting and allow volunteers access to your water supply, etc. We strongly urge you to be available on planting day to ensure proper placement and any other potential issues. 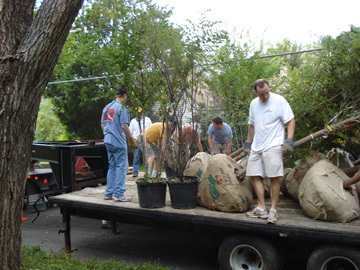 All tree hosts must commit in writing (a form will be circulated) that they will keep the tree mulched and watered for at least 2 years so it can get established. Mulch will be provided on the day of planting. After that, it is your responsibility. Tree maintenance guidelines will be forwarded to the tree “hosts” once we receive an approval. Please contact Claudia Worme at cjworme@sbcglobal.net with any questions.